Recently I have posted about my art quilts. Yes, I have more than the Zinnias (on my avatar profile) started! Actually two in the works and another two picked out and just waiting for me to start on them! i don't know. I guess it comes from a jumbled up mind! My friend told me it was an over active creative mind. Yes, she is being nice! Heh. i started this pinwheel last year for our master bedroom. I have only 12 squares started and one of them finished with the small yo-yo center. I saw a pinwheel design recently that had no borders except on the outer sides. I think I like that and am going with it even though it means I have to make more 12" squares. 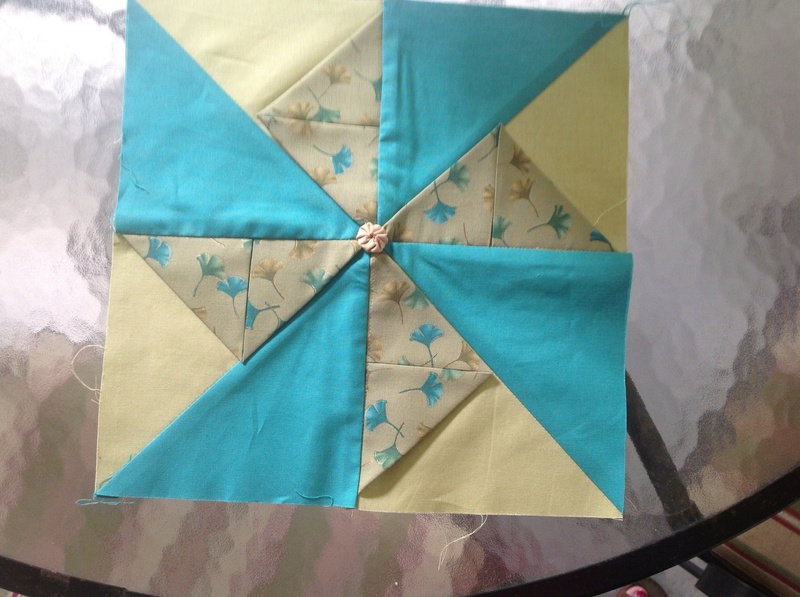 I might not be able to purchase any of the pinwheel fabric, but I want to use it as the outside border. I was originally thinking traditionally, but I think I want to go without the borders separating the squares. I took two pics. But the one inside didn't do the fabric colors justice. These border situations are gonna be the death of my creations!LOL I guess I can look at it on the framing of my artwork, the choice of mats always did me in too! Gracious! Ummmm.......that might not work. I realize that if I had used the same solid color around the pinwheel it would of. Back to thinking this out again. I am still open to suggestions guys and gals! Looks interesting. Good for you, stretching the sides of that "box" we seem to fall into so much! That which you are calling "borders" are probably more appropriately called "sashings"........plain strips between the blocks of a quilt. I think your quilt is so cute it doesn't need sashings to separate the blocks (I personally don't like sashings most of the time, I must confess). Consider playing with larger plain borders that you could applique more yo-yos onto. 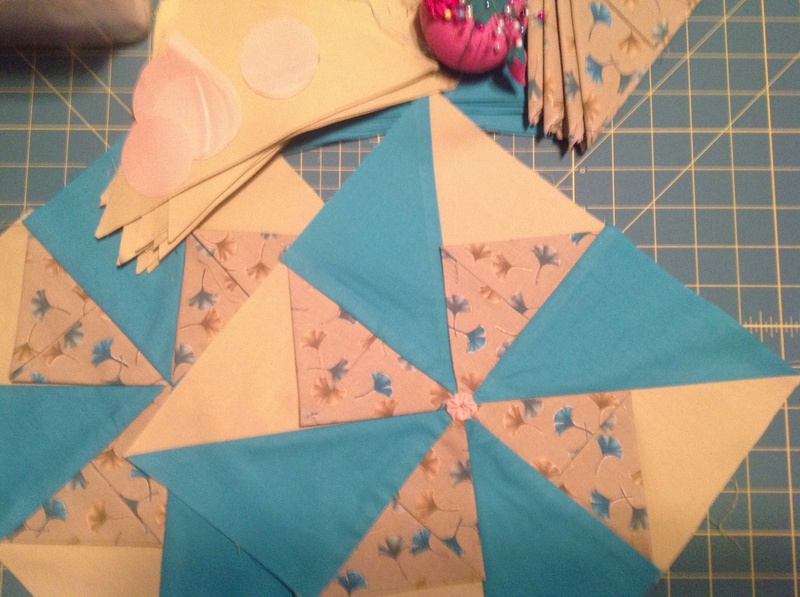 Maybe quilt it with curvy lines to represent wind blowing to spin those pinwheels. No matter what, it'll be cute! I love your blocks, they are so pretty. I would not use sashings but I would use a border. My Mom said the same thing this morning! It didn't need "sashings"(maybe I will learn all the quilting words and definitions one day!) ;-) you ladies are Johnny on the spot!